This Saturday, January 7th, 2012, at 2 pm, the Southern Food and Beverage Museum hosts Vega Tapas Cafe’s chef Glen Hough as he prepares Jazzmen brown rice paella (details here). 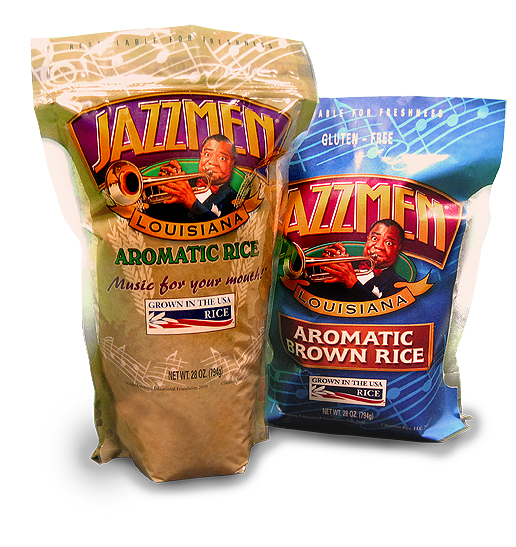 Jazzmen brand rice is an aromatic jasmine variety developed by the LSU Ag Extension service, and it is Louisiana-grown, packaged, and sold under the Jazzmen brand (with Pops blowing a trumpet front and center on each bag). Look for Jazzmen brown rice and white rice at chain and independent grocers throughout the South, and in California. Your purchase supports local farmers and entrepreneurs, and its success encourages Louisiana’s continuing investment in agricultural research. P.S. This is my 800th post on Bouillie. Thanks for reading! I love jasmine rice but normally associated it with Thai food because that’s how I first discovered it when I was a young adult. The nutty aroma and sweet flavor make it so much better than just plain rice. I’ll be looking for Jazzmen, it’s not in Knoxville yet but we are getting a Whole Foods this year and it looks like they carry it.